Although it' seems hard to believe, there is more to September than 'back to school'. The first Sunday after Labour Day - this year it's September 7 - is officially dedicated as National Grandparent's Day, a celebration of the role our elders play in shaping our lives and the lives of our children. As with most holidays, Grandparent's Day began in the U.S. It was first proclaimed in 1978 by President Jimmy Carter and was designated an official day by our own House of Commons in 1995. Officially the purpose is to 'acknowledge their importance to the structure of the family in nurturing, upbringing and education of children'. We think this is great, but perhaps more simply, it should be about appreciation. Taking time to appreciate who our grandparents are, their devotion and the fact that without 'them' there'd be no 'us'. 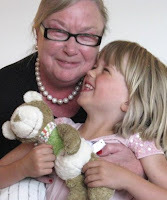 More than ever it seems many grandparents are playing a significant role in shaping children's lives. Whether it's one day, two days or five days a week, as the cost of daycare continues to rise, lots of families rely on grandparents to provide care giving as Mom returns to work. In British Columbia alone, 9932 children are being raising in the homes of grandparents, 45% of which are single grandparents, according to the North Shore Neighbourhood House's Grandparents Connections Program. The Program offers a weekly support group, Grandparents Raising Grandchildren so grandparents can share any challenges, issues and joys they're experiencing in their role as caregivers. Make your grandparent's day on September 7 by giving a memory for them to look at and remember. 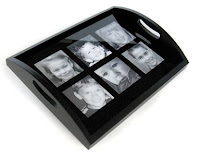 Why not frame a favourite photo in a lovely photo frame, album or a unique photo serving tray? How abo ut giving a keepsake leather journal and asking your grandparent to jot down some memories for you to keep, or better yet, sit down and do it together. Grandparent's Day is a great reminder that these fantastic people in our lives are a wealth of wisdom and love. Let's teach our children to treasure them on this day and beyond. For a selection of thoughtful and unique gifts for Grandparent's Day and any day of the year, visit Lavish & Lime.We offer gift wrapping, complimentary gift card enclosures and will ship your gift anywhere in Canada.